This site describes enjoyable games, gives you background about their creation, and answers frequently asked questions. 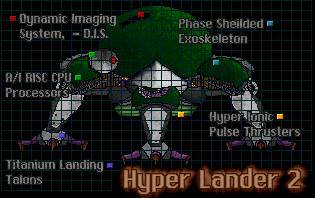 For example, at the left you'll see the title screen for Hyper Lander 2, which combines puzzle and arcade game genres. So, read on, and contact me if you have comments or suggestions! Welcome to My Games Web Page! Can you give me any clues for conquering Hyper Lander? Practice developing your flying technique, the key is flying smoothly and learning to use the two engine thrusters correctly. Will you make another sequel to Hyper Lander? The story has some wrinkles which haven't been explored yet so it is likely that a sequel will be produced in order to address them. Keep checking the site for new updates. How does the Internet figure into game development? Typically if you have wanted to play a particular game then you have had to go to a software store and purchase a box which contains CD-ROM's or floppy disks. Games are packaged this way because the data which makes up most games takes up so much space and because physical stores have been the only place to showcase them. This data can take the form of graphics, sounds, character files, help, and of course the game engine itself. Now with the gain in popularity of the Internet, gamers don't have to get a game from a physical store, and in some cases they don't even have to install a game on their own computer. One of the contributions of the Internet to gaming has been games which exist entirely online. Project BOB is an example of this kind of game. It's graphics and code exist on the web and are expressed through a web browser. This means that updates are easier to distribute to fans of a game who visit a central storage for the game each time they log on to play it. Only 32 images are used to create BOB (six images are for BOB himself). The data that draws BOB has over 3:1 compression (but is on the same page). BOB works on all computer platforms using a proper browser (it even works on a Unix workstation -- there are special automatic adjustments for speed on HP workstations). BOB does not rely on any Applets or CGI Script pushing. The page of BOB is about 25kb, and the images for BOB are less than 7kb (most average pages have over 30kb).